Phillip K. Dickish plot where a futuristic technology goes awry. A process of selectively erasing painful memories gets mixed-up, and the hero accidently gets the fragmented pieces of the past a murderer was deleting. Since there are no identifying marks on the memory clips, The hero races to pieces together the fragments of the past while he is hunted by the owner of those memories. Stylish, well plotted, though a bit daffy. A group of scruffy Chinese track workers in a Dirty Dozen-ish plot try to sabotage the Japanese railroad during WWII. The patriarchal leader of the band is Jackie Chan and the movie is full of eye-popping stunts, mainly done by younger stars, including his son, Jaycee Chan. This film is hailed for uniting the father and son, who had been estranged after the son went to jail on drug-related charges. Perhaps the best film of the year. 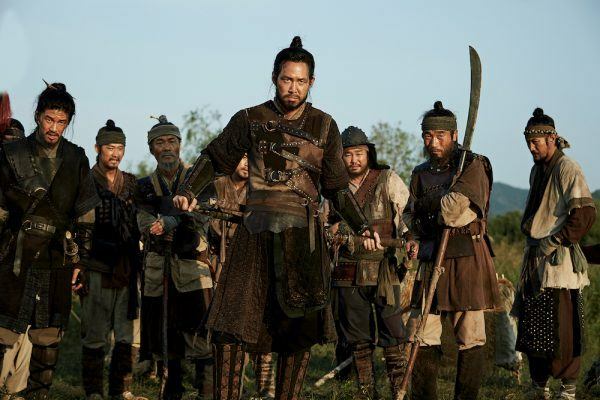 In 16th century Korea, nobles have to serve in the army, but can pay peasants to take their places. When Japan invades, the fleeing king, so as not to rattle populace promotes a lesser son to temporarily be the ruler. A complex plot and great adventure scenes ensue as the proxy king guarded by stand-in soldiers escapes to the mountains. While presenting an exciting plot, the film is also a thoughtful consideration of what it means to be a surrogate. In a Beetlejuice-like opening in the afterlife waiting room, a lawyer finds out she has died in violation of fate’s timetable. While the clerks reshuffle the papers to prepare her to return to earth, she takes on the life of a housewife, who died a week too early. It’s a clunky set-up, but a touching and sincere movie about a yuppie learning how the other half lives. World-renowned director Ann Hui describes HK under Japanese occupation. When the invaders decide to round up all the dissident writers, the resistance collects them: a spindly, nerdy lot, to spirit them away to the liberated zone. Largely a psychological study of how a woman and her mother are drawn into the fight against (Japanese) fascism. Eddie Peng, who plays a bold resistance leader in Our Time – so bold that to get money for supplies he presents himself at a Japanese meeting, which had said that says it will reward anyone who brings in Peng (for expected arrest). Peng demands the money. Here he is even bolder as Wu Kong, the Monkey King. I’ve reviewed this film elsewhere, but let’s just say the near anarchist plot has Monkey saying he is sick of the earth being ruled by gods, so he’s decided to eliminate heaven. Based on a Japanese novel, this incredibly tightly plotted murder mystery, premise, revealed in the beginning, is that a brilliant and isolated math teacher, secretly in love with his married neighbor, agrees to help her. Fighting back against her battering husband, the woman kills her spouse. The teacher devises the perfect crime, after the fact. Ingenious and magnificently acted. Taut thriller with an amusing premise. When the handsome young star is framed for a murder and escapes, he needs the help of his gamer friends, people he has never met face to face though he has led their team to victory on many videogame championships. Turns out they are all middle-aged couch potatoes, though they prove their mettle in this twisty puzzle. China’s big summer blockbuster in which writer/director/lead Wu leads a strike force to rescue a group of Chinese workers besieged in an East African factory by American mercenaries working for a local warlord. A rousing adventure yarn, it is also considered, by some pundits in the Chinese press, an indication that with isolationist Trump in charge, it’s China’s time to step up to become the world’s peacekeeper.